Young and in love, their lives ahead of them, Tami Oldham and her fiancé Richard Sharp set sail from Tahiti under brilliant blue skies, with Tami’s hometown of San Diego as their ultimate destination. But the two free spirits and avid sailors couldn’t anticipate that less than two weeks into their voyage, they would sail directly into one of the most catastrophic hurricanes in recorded history. They found themselves battling pounding rain, waves the size of skyscrapers, and 140 knot winds. Richard tethered himself to the boat and sent Tami below to safety, and then all went eerily quiet. Hours later, Tami awakened to find the boat in ruins, and Richard nowhere in sight. *Adrift *is the story of Tami’s miraculous forty-one-day journey to safety on a ravaged boat with no motor and no masts, and with little hope for rescue. 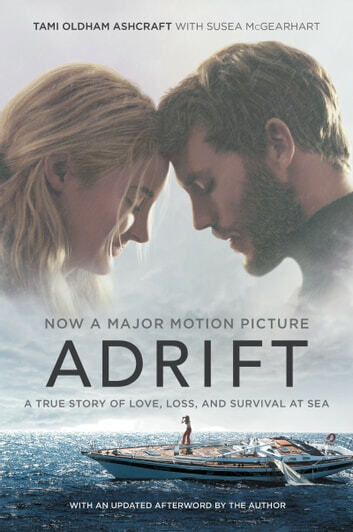 It’s a tale of love and survival on the high seas-- an unforgettable story about resilience of the human spirit, and the transcendent power of love. After watching the movie, for me it left more questions and left out the detail this book provided. This heartbreaking story is one of amazing survival, and made me feel like I was there. I enjoyed and appreciated the romance, wanderlust and descriptive content of the book. This was a heartbreaking,intense book to read. Once I started reading it, it was almost impossible to lay it down. I have not yet seen the movie, but hope to do so soon.